It’s progress of sorts that Adam Sandler’s latest comedy is merely vapid as opposed to another affront to the medium of cinema. It’s also cause for relief, since the South African setting of Blended could easily have proven dangerous mix with Sandler’s usual lowbrow antics. Make no mistake: the film isn’t a beacon of multiculti enlightenment. But it’s also not so offensive it sends you scampering for the exit door. After Jim (Sandler) takes Lauren (Drew Barrymore) on a bad blind date at Hooters, contrivance devises a scheme wherein the two single parents and their respective children—him three girls; her two boys—are thrust together on vacation at an African resort for mixed families. As regrettably expected, there’s plenty of questionable puerile, vulgar and ethnic humor. Much comes compliments of a vacationing May-December couple (played by Kevin Nealon and Jessica Lowe). 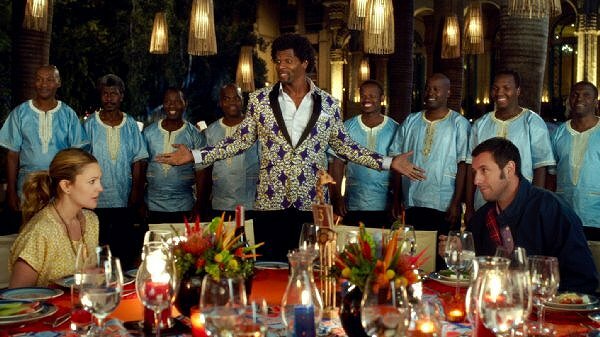 More cringeworthy is Terry Crews’ role as the lead singer of a ubiquitous African Greek Chorus. Yet there are also weighty issues at play, from adolescent maturation to dealing with a marriage destroyed by infidelity to the death of a parent/spouse. This unholy mix of serious and silly is epitomized in the character of Jim’s middle daughter (Emma Fuhrmann). Jim lost his wife to cancer years ago, yet his preteen continues to see and converse with her deceased mother. However, every poignant involving her lingering emotional trauma is undercut by the character’s name: Espn (pronounced S-pen), as in Jim’s favorite sports network. There’s Jim’s androgynous daughter Hilary (Bella Thorne), sporting shorn locks and track suits, who transforms into a beautiful swan with the help of Lauren and Jake (Zak Henri), a brooding Edward Cullen wannabe. On the other hand, Lauren’s elder son Brendan (Braxton Beckham) harbors a creepy obsession with his teenage babysitter. However, what keeps the film afloat are the shared scenes between Sandler and Barrymore, each never better than when cast opposite the other. They recapture the easy chemistry from their previous collaborations, The Wedding Singer and 50 First Dates. Together, they make Blended one of the few “comedies” which is better when the would-be yucks subside and the casual banter begins.